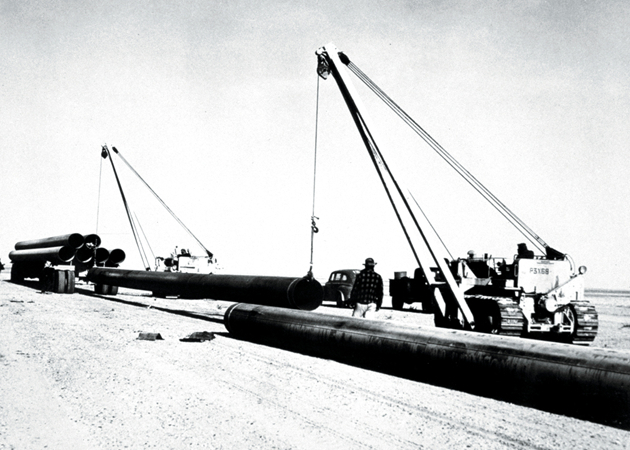 Suliman S. Olayan founds General Contracting Company, his first business, to provide transportation and related services to Bechtel on Aramco's massive Trans-Arabian Pipe Line (Tapline) project. Suliman S. Olayan plays a key role in developing Saudi Arabia's earliest electric power companies and founds the country's first public utility, the National Gas Company. 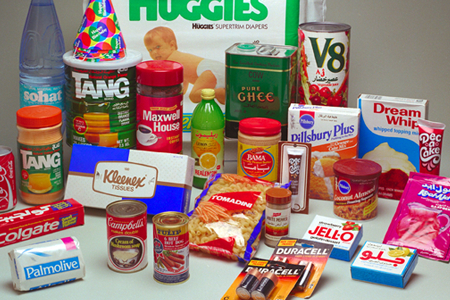 In 1954, General Trading Company, a bulk supplier of food and consumer products, is established as the exclusive Saudi distributor of major international brands, including Kimberly-Clark, General Foods, Pillsbury, and Hunt Wesson. 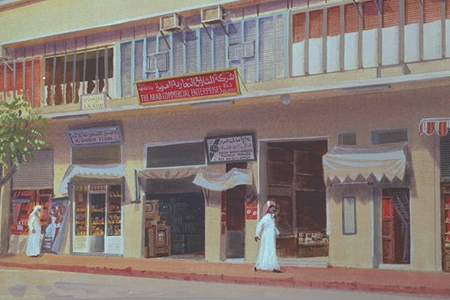 Arab Commercial Enterprises is founded, later to become the largest insurance brokerage in the Middle East. General Contracting Company (GCC) establishes a branch for heavy automotive equipment and parts. GCC becomes the exclusive distributor of Cummins engines, Kenworth trucks and Atlas Copco compressors, relationships that endure today. 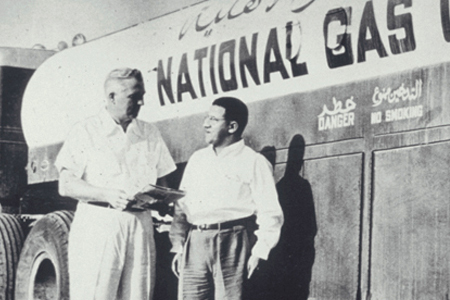 In 1959, a corporate liaison office opens for business in Beirut, Lebanon, to facilitate a major transportation contract with Aminoil/Getty Oil in the Saudi Arabia-Kuwait Neutral Zone. It is the Group's first non-Gulf office. The Olayan Group establishes its first company outside of the Middle East - an investment portfolio in U.S. equities. Olayan enters into an agreement with Kimberly-Clark to construct the first tissue converting plant in Saudi Arabia. The Group opens an office in New York. The Group's joint venture company with Bechtel is given the contract for the engineering and project management of Jubail Industrial City. The Group opens an office in London. The Group acquires a more than 5% equity holding in Donaldson, Lufkin & Jenrette (later increasing to nearly 25% before being sold to Equitable Life in 1985). The move establishes the Group's long-term international approach, involving substantial minority stakes in a highly selective core group of companies. Olayan Investments Company Establishment (OICE), the parent of The Olayan Group established in 1975, opens a branch office on Syngrou Avenue in Athens, Greece. A new office, pictured here, opened in the Athens suburb of Glyfada in 2000. The Group acquires a significant stake in First Chicago Corp. The Group acquires a significant stake in Occidental Petroleum Corp. The Group establishes a company to sell Xerox equipment in the Kingdom. An agreement with The Coca-Cola Company establishes the Saudi franchise for Coca-Cola products and services. The Group purchases a substantial ownership interest in CS First Boston. By 1998 this will become a 5% stake in Credit Suisse Group. The Group enters into a joint venture with Colgate-Palmolive covering the entire Arabian Gulf region. The Group enters into an exclusive arrangement with Burger King Restaurants for large areas of the Middle East. Olayan Food Services Company soon opens the first Burger King restaurant in Riyadh. The Group acquires a 5.3% stake in Chase Manhattan Corporation. The Coca-Cola Bottling Company of Saudi Arabia establishes the first of three bottling plants in the Kingdom. The Group acquires a 12% economic interest in Britain's National Grid. The Group marks its 50th Anniversary. Suliman S. Olayan's biography, 'From Unayzah to Wall Street' is published. During a turbulent time in the US stock market, the Group steps up to anchor the historic MetLife IPO by acquiring 12.4% of the offering. Khaled S. Olayan is named Group Chairman. The American University of Beirut names its School of Business for Suliman S. Olayan. A brand new home for the business school, pictured here, opened in 2009. The Group marks its 60th Anniversary. The Group co-invests with a group of other leading firms in Related Companies, a major US property developer. Cummins Olayan Energy Ltd. is formed as a joint venture between the Group and Cummins Power Generation Ltd. The Group takes a significant stake in Visa Inc., the most important IPO of its time. Electronic payment becomes a key long-term investment theme for the Group. Baxter Company Limited is formed as a joint venture between the Group and Baxter Healthcare Corporation. The Group enters into a joint venture with CH2M HILL for the planning and management of major infrastructure projects. The Group acquires the Knightsbridge Estate in central London - an unbroken block measuring 3.5 acres that includes office, retail, and residential space. The Group marks its 65th Anniversary. In its largest real estate acquisition to date, the Group purchases the Paris portfolio from Risanamento. It includes prime office, retail, and residential assets in the city's prestigious central district. In partnership with Starwood Capital, the Group sells its interest in the Baccarat Hotel in New York to a Chinese insurance firm -- Sunshine Insurance Group. Through a joint venture with Mandarin Oriental, the Group acquires The Hotel Ritz in Madrid. Cummins Inc. and The Olayan Group form a three-country distribution joint venture in the Middle East, furthering a business relationship that began 60 years ago. In association with Chelsfield, the Group purchases 550 Madison Avenue in Manhattan, otherwise known as the Sony Tower. Long-serving senior executive Aziz Syriani is succeeded by Robert Leary as Chief Executive Officer of the Group. Mr. Syriani remains Chairman of the Corporate Board. 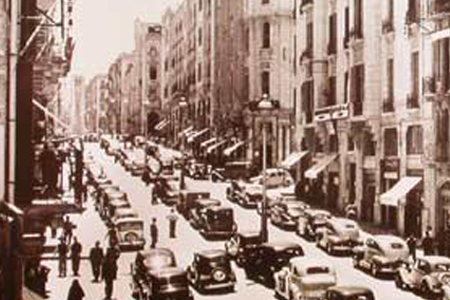 The Group marks its 70th Anniversary with celebrations in Riyadh, Athens, New York, and London. Following her retirement as CEO of Olayan America, Hutham Olayan succeeds Aziz Syriani as Chairman of the Corporate Board.